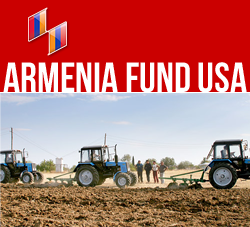 NEW YORK, New York — Armenia Fund’s annual Board of Trustees meeting on May 14 was preceded by a string of noteworthy accomplishments, celebrated by the opening ceremonies of five different projects. The events, which took place in Armenia and Artsakh, culminated symbolically in the inauguration of the renovated Maternity Ward at Yerevan’s St. Astvatsamayr Medical Center on May 12. All five opening ceremonies were attended by the fund’s trustees and scores of affiliate representatives, who had traveled to Yerevan from throughout the world for the 19th annual Board meeting. At the opening ceremony of the Maternity Ward, the honor of cutting the red ribbon was given to chairperson Armineh Carapeti, Chair of the Fund’s British affiliate, which had financed the reconstruction of the medical facility. The jubilant occasion was attended by Republic of Armenia Health Minister Harutyun Kushkyan, Yerevan Mayor Gagik Beglaryan, Hayastan All-Armenian Fund Executive Director Ara Vardanyan, and numerous other guests. “The future of our nation depends, first and foremost, on the physical well-being of our people,” Ms.Carapeti pointed out. Her conviction is shared by hundreds of British-Armenian donors who have contributed to the St. Astvatsamayr Medical Center Maternity Ward project. Major benefactors of the initiative include Anahid Association of London, which has financed the renovation of three delivery rooms, and the Demirdjian family, whose contribution in memory of Hrayr Demirdjian has made possible the modernization of the surgical sector. Other benefactors include the St. Sarkis Church Ladies’ Committee and the Tahta family. On his part, Armen Grigoryan, director of the Obstetrics Unit at St.Astvatsamayr, said that the Maternity Ward’s vastly enhanced capabilities will result in a considerable rise in the number of deliveries at the facility. Prior to the renovations, the ward’s technical shortcomings meant that it had to limit the number of its deliveries to 1,400 per year, with numerous expectant mothers redirected to other hospitals for lack of appropriate wards. Today six deliveries can be accommodated at any one given time. “Now that we have state-of-the-art surgical and delivery equipment, and our renovated facility ensures every conceivable comfort and convenience, including lavatories in all patient rooms, we are able to provide medical care of the highest quality,” said Jenni Hovsepyan, director of the Maternity Ward. Armenian Fund’s British affiliate continues to rally the British-Armenian community around critically important projects in Armenia and Artsakh. It was announced that the next major initiative to be sponsored by the affiliate which is the reconstruction of the Kapan Pediatric Hospital, in Armenia’s Syunik Region, has already commenced.